The race is run in accordance with the rules of ASA and WPA. 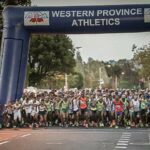 Detailed rules are available on www.wpa.org.za or on request from the organisers of the WPA office. Minimum age in the 10km is 14 years. Participants in this event do so at their own risk and release and discharge the organisers, sponsors, provincial and national athletics bodies and all persons assisting in staging the event from any responsibility, liability or costs relating to any injury, loss or damage of whatever nature, however caused, arising directly or indirectly from their participation in the event. 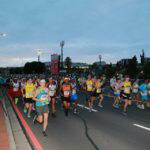 Runners must obey traffic officers, race marshals and race officials at all times. Licensed runners should run in club colours and a license valid for 2019 must be worn on the front and back of the vest or purchase a temporary license to be worn on the back of the vest. One race number (bib) will be issued. The race number must be worn on the front of the vest, partially covering the ASA license, so that the ASA licence sponsor remains visible. No personal seconding permitted except at official refreshment stations. Temporary License holders when registering must complete and hand in the tear off strip from the number in order to be eligible to compete. Temporary licensed runners to wear plain clothing, no advertising. Temporary licensed runners must wear the race number on the front of their vest and the temporary license on the back. In addition to Overall (Open) prizes, participants will only be eligible for an age category prize in the age category they enter. Corresponding numerical age category tags must be worn on the front and back of their Club vest. 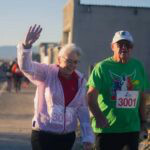 Participants may enter the age category corresponding to their chronological age or any younger category down to senior. To qualify for team prizes, athletes must wear full club colours and participate with a permanent license. Age category tags must be worn (front and back) and visible for the entire race to be eligible for any age category prize. Race cards need to be completed before race day, must be carried during the race and handed in once you have completed your race. Runners must carry their entry cards for the duration of the race. No swopping of race cards as it is linked to your name and finishing time and may result in disqualification. Tog bag facilities will be provided at own risk. For safety reasons the use of personal music players with headphones is not allowed. Use of such device in contravention of IAAF rule 144.3b, may result in disqualification. Do not litter. Dispose of sachets and cups responsibly by using the boxes provided or carrying them to the Finish. Report offenders to the referees. Foreign athletes must comply with IAAF rule 4.2 and all relevant race and domestic rules. The athletes must be able to produce the letter from his/her federation permitting participation on race day. Wheelchair athletes must please contact the organizers timeously to discuss arrangements for their participation. ENTER ONLINE: At www.topevents.co.za. For enquiries, contact Top Events: 021 511 7130 or email: info@topevents.co.za. Closing date for online entries: Midnight 31st March 2019. INSTORE ENTRIES: Instore entries will only be taken at Sportsman’s Warehouse Rondebosch and Tygervalley. You will receive two till slips, one to be stapled onto your entry form and the other serves as your proof of entry. Please bring this with you to number collection which will take place on race day. Closing date for in-store entries is 27 March 2019. Entries will be accepted on race day from 04h45. A 14% service fee is charged when entering online. 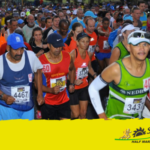 Subject to pre-entries and any participation limits imposed by the relevant authorities, limited entries may be available on race day for the Central Athletics 10km challenge and 5km Fun Run. 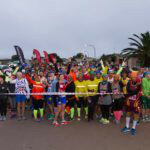 Number collection for in-store and online entries will take place at Groote Schuur High School on Friday 5 April from 14h00 to 19h00 and on race day Sunday 7 April from 04h45 to 06h45. Race cards need to be completed before race day and must be carried during the race and handed in once you have completed your race. No race card, no result. The race starts outside Newlands Cricket Stadium.